When I saw this scene near Mt. Storm, WV, a multitude of questions zipped through my mind. 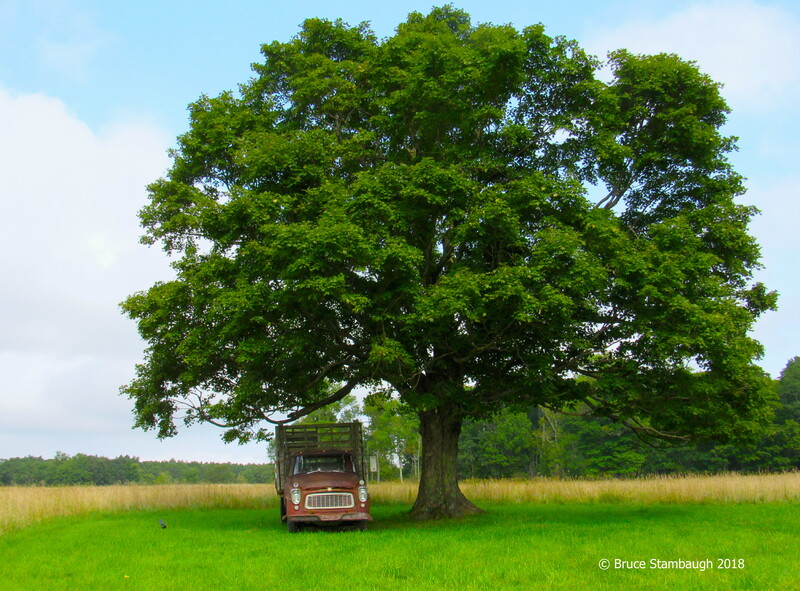 Why was this old farm truck parked under this giant sugar maple tree? What stories could it tell? What had it hauled during all those years of service? Did the farmer have a special place in his heart for this faithful old truck? Did he park it under the tree for protection? Did he park it close to the highway for others to enjoy? I don’t know any of the answers to those questions. However, I do know that the truck and the tree caught my attention. There was something poetic about the ancient tree sheltering the old vehicle like a hen protecting its chick. Whatever the reasons, “Old Truck, Old Tree” is my Photo of the Week. This photo of my our mother and my siblings and me was taken at Christmas 2011. My four siblings and I were spoiled. We were very fortunate to have a loving, devoted mother. Unfortunately, not everyone can say that. Growing up, Mom cared for us in every way imaginable. She fed us, clothed us, nurtured us, played with us, corrected us, loved us, and so much more. Those were the roles and expectations of a post-World War II wife and mother. In those days, careers for females were pretty much limited to secretary, nurse, or teacher. Mothers were expected to be at home to care for their children. It’s just the way it was. 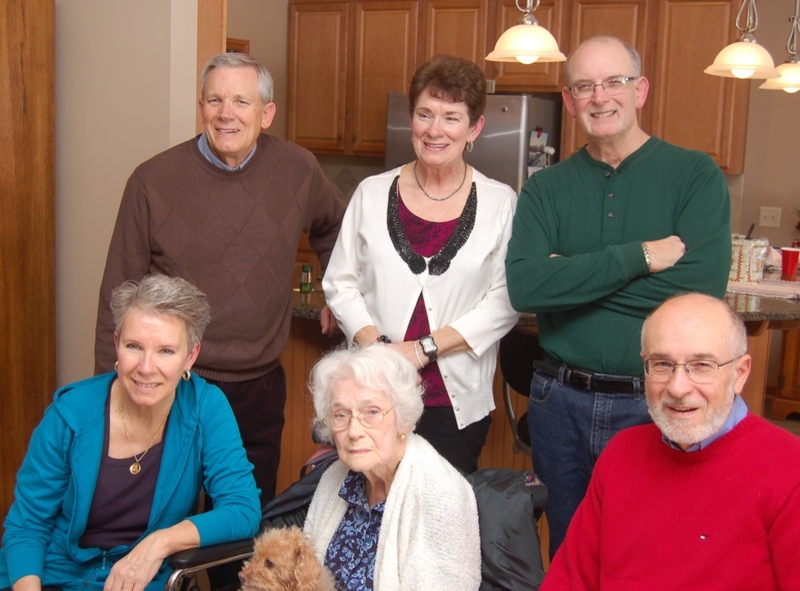 My brothers and sisters and I were the beneficiaries of Mom’s time, effort, skills, and wisdom. I wouldn’t have wanted it any other way. Life couldn’t have been easy for her. We weren’t wealthy by anyone’s standards, but we weren’t poor either. We grew up in the suburbs of a blue-collar town in northeast Ohio’s mid-20th-century industrialization. Mom reassured us when we were scared, nursed us when we were sick, and encouraged us in our schoolwork. How she did all that and kept her sanity, I have no idea. We were five active kids, all with different needs, wants, and interests. Somehow Mom made time for each one of us, though I remember plenty of times when we wore her patience thin. “Wait until your father gets home” was a familiar tune in our household. Usually, that comment was directed at one of my siblings, not me. Children of every age filled our close-knit neighborhood. Many times the number of youngsters in our household doubled in number as friends came and went. If we got too loud or rowdy, however, Mom lowered the boom. She not only modeled justice, but she also instilled it in us. Most likely I am romanticizing those fond memories. Not everything always went smoothly of course. We had personal, relational problems just like every other family. As much as we admired our father, he wasn’t the most helpful or responsible husband when it came to household chores or repairs. Later in her life, I told my mother that she had raised six children, not five. With no explanation needed, her hardy laugh affirmed my comment. 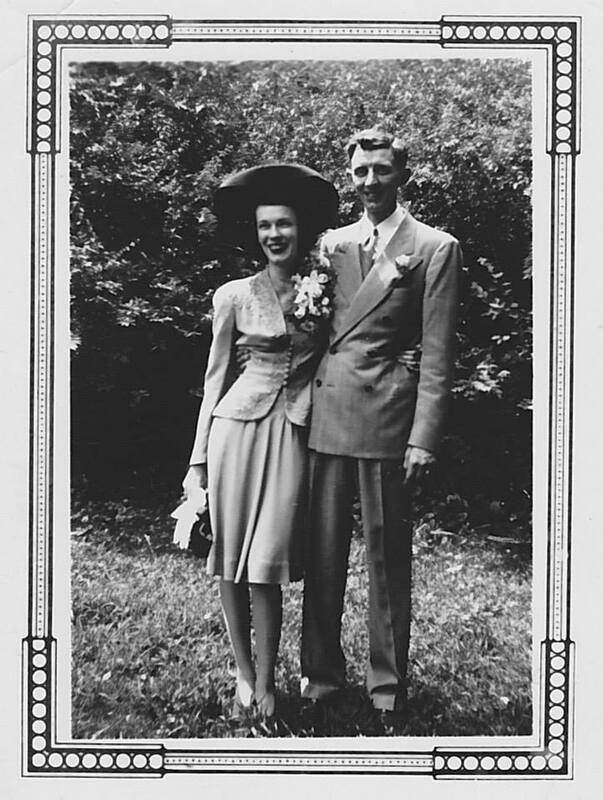 Mom was a string bean of a woman. She cooked us nourishing meals but seldom ate much herself. Mom could speak her mind, however. She let Dad have it in no uncertain terms when he arrived home from a fishing trip without my older brother, a cousin, and me. Having been left in a raging thunderstorm frightened us. Dad had to weather a storm of his own with Mom. Mom was a multi-talented person. 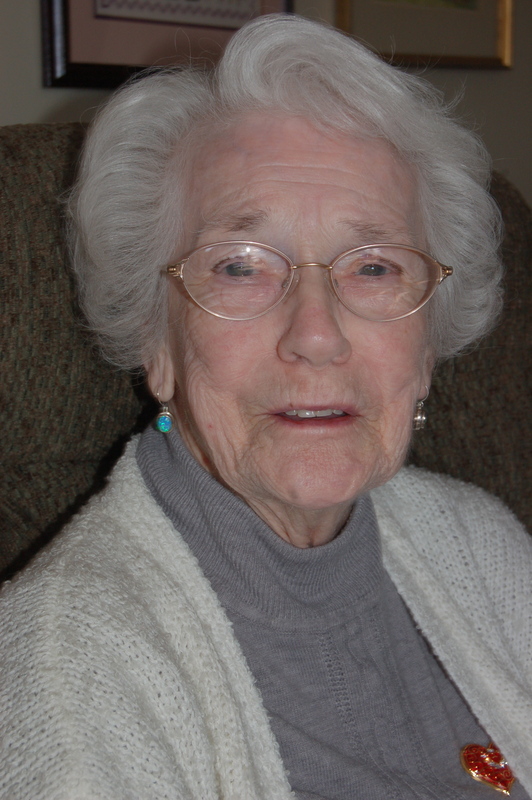 Besides her homemaking skills, she was an accomplished artist, loved to play cards, bowl, and shop for antiques. 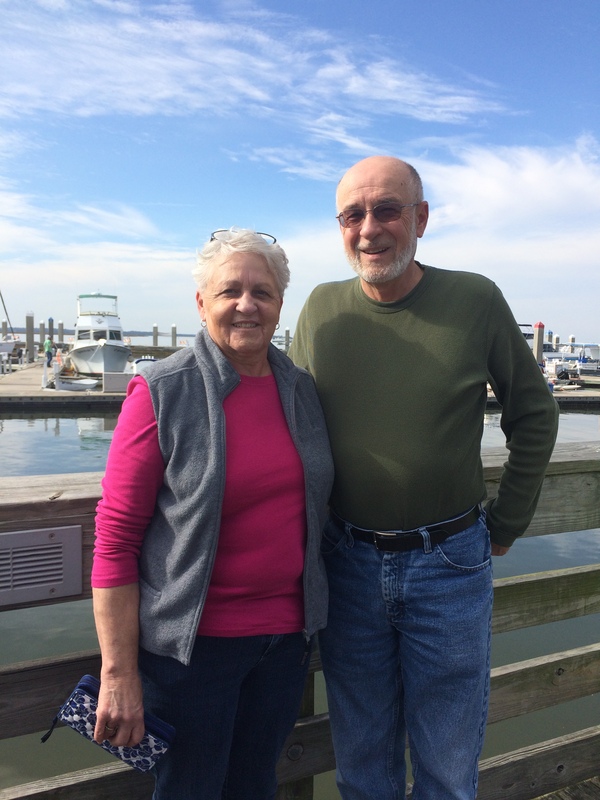 In their retirement years, she and Dad relaxed at the cottage they had built on a fishing lake in southeast Ohio. Not only was our mother talented, but she was also a looker. Some folks actually wondered what Mom saw in Dad. Their 68 years of marriage answered that question. I don’t mean to paint her as a saint. Mom wouldn’t want that, and she would be the first to say that she made mistakes in her motherhood. I just remember feeling really safe around her. That was no small matter. 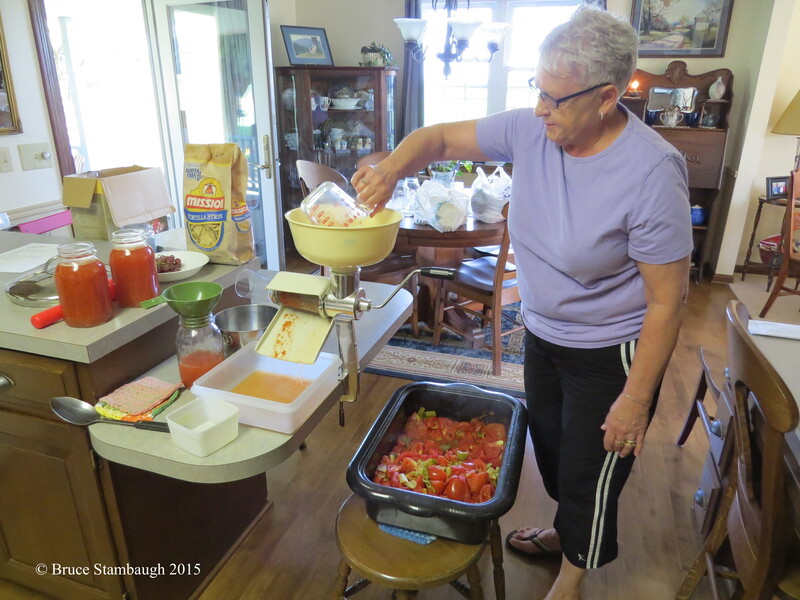 In my youthful naiveté, I thought everyone had a mother like the late Marian Stambaugh. My lifetime experiences unfortunately proved otherwise. I wished for their sake that they had. Now, I am forever grateful for my loving mother. 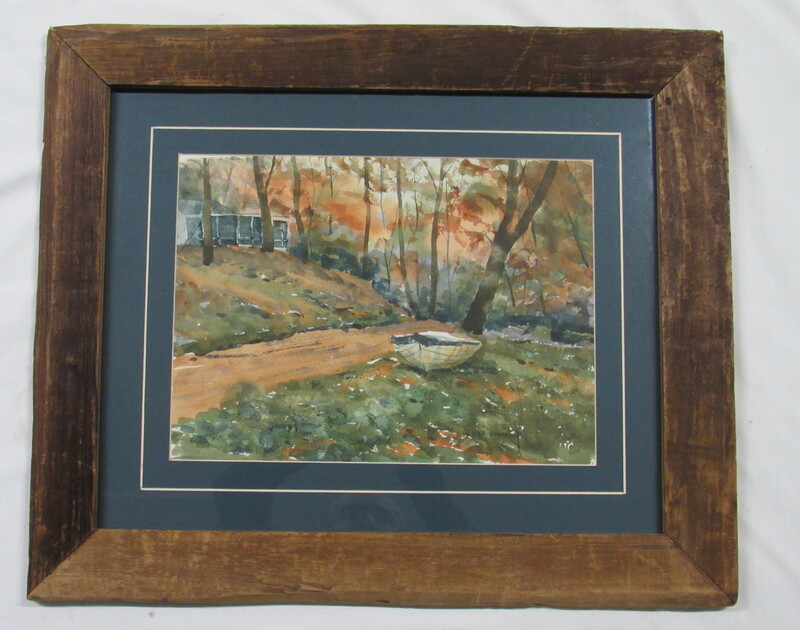 One of Mom’s many watercolors. Our modest outdoor light display. Decorating for the holidays is a given at our house. My wife and I have modestly festooned our places of residence ever since we were married. 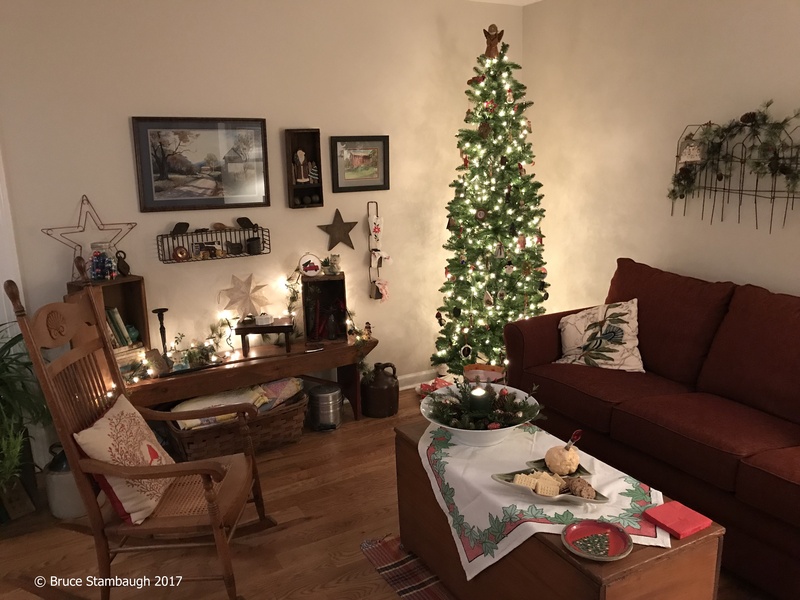 Before that, we both grew up in homes that embraced the holidays with tinsel and trees, colorful lights and holiday wreaths, Christmas cookies and stockings hung with care. We carried over some of those traditions but also created new ones with our own family. This year nothing changed, and yet, everything changed. We still decorated, just in a new location. Old traditions, long-held and revered, came to an end. We will miss our annual Christmas Eve morning gathering with dear friends and extended families for that meaningful and nutritious breakfast. Those warm memories are still held alive in our hearts. With the move from Ohio to Virginia, we knew that preciousness would be left behind. We also anticipated new activities, new celebrations, and new gatherings with our daughter’s family and old friends who had relocated here, too. And one by one, those are happening. 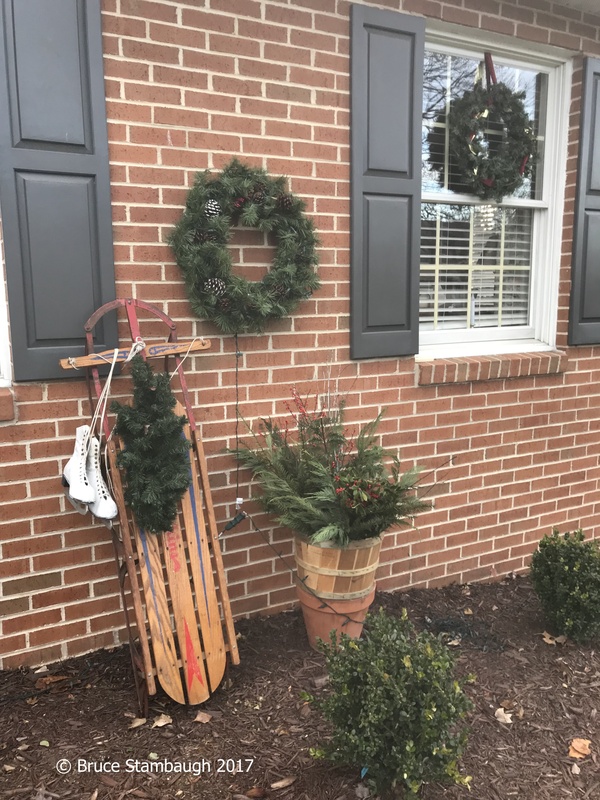 With decent weather in late November, my energetic wife got a head start on the celebratory decorating inside and out. I had no choice but to join in. With a smaller house and fewer shrubs, our exterior lighting display lessened, too. 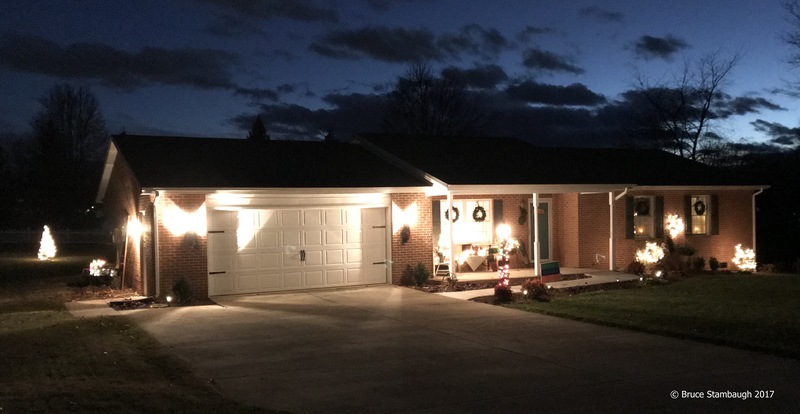 Just like all those years in Holmes County, Ohio, artificial greenery loaded with colored lights still got wound around the welcoming light pole that shines on the sidewalk and driveway. Artificial evergreen wreaths adorned with burgundy and purple ribbons hang from each window. Below them, battery-powered candles offer soft reminders of the reason for the season. Strings of white lights brighten the porch and a unique old bench we recently purchased at an antique store. Strings of cheery white lights twinkle from our little concolor fir tree we planted in honor of a dear friend, who died much too soon. 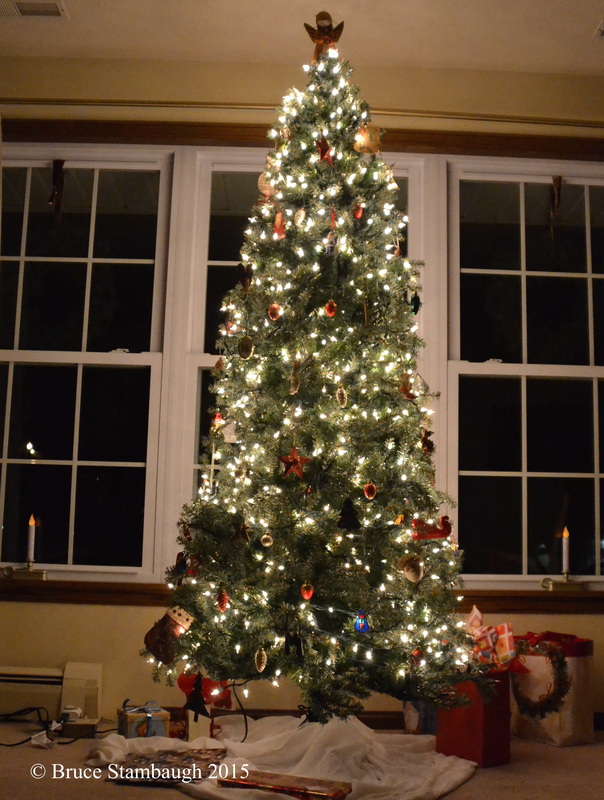 Our “Jenny tree” shines brightly, just like our late friend did with everyone she met. Inside, we splurged and purchased a new artificial tree and hung trinkets and ornaments that hold personal memories. The same angel as previous years hovers at the top of the tree, blessing all who enter. Neva received it years ago as a gift from one of her students. My creative wife has a magical touch in making the mundane shine with holiday cheer. 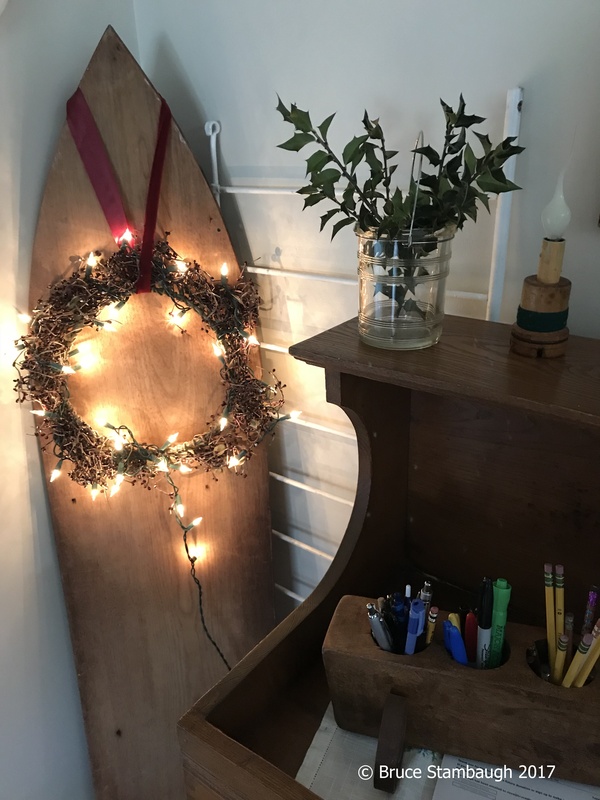 A grapevine wreath wrapped with strings of little white lights bedecks the top of an old oak ironing board that Helen Youngs, our Holmes County grandmother, gave us. The stockings hang from door pulls on the bookshelf instead of the old barn beam mantel on the brick fireplace in our former Ohio home. I’m sure Santa will find them just as quickly. We do miss that fireplace. Its radiant heat and sweet-smelling goodness just seemed to say Happy Holidays each time I fired it up. Now, we take extra effort to share similar warmth in the season’s greetings we offer others however and wherever we can. After all, the Christmastime fire must always burn from within to ensure its joy is seen and felt by all. Lighting up the ironing board. The chances for a white Christmas in Virginia aren’t the best. I recall many an Ohio Christmas where that was also true. We joyously celebrated anyhow, and we will do so again this year. At the darkest time of year, Hanukah, Kwanzaa, and Christmas all are celebrated with lights. That is most appropriate. 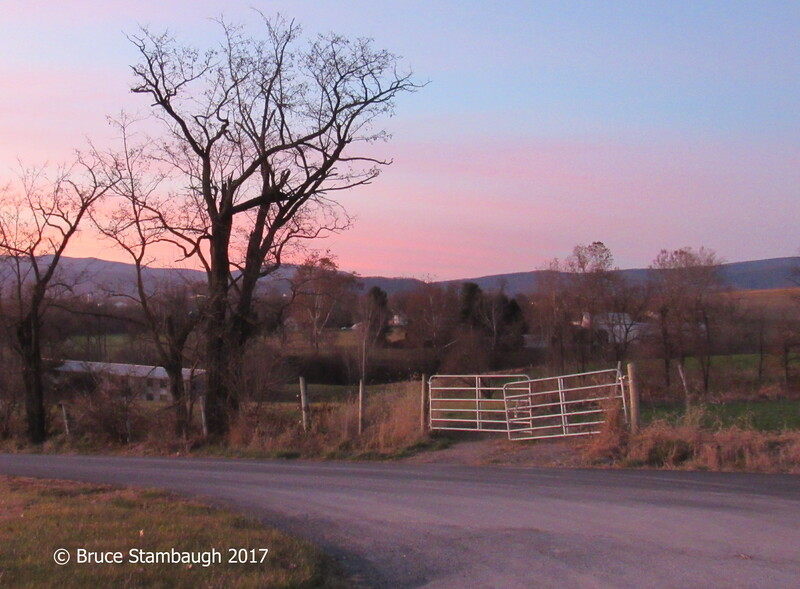 All is well here in the lovely Shenandoah Valley. May the season’s joyous light bless you and yours whatever your holiday situation may be. 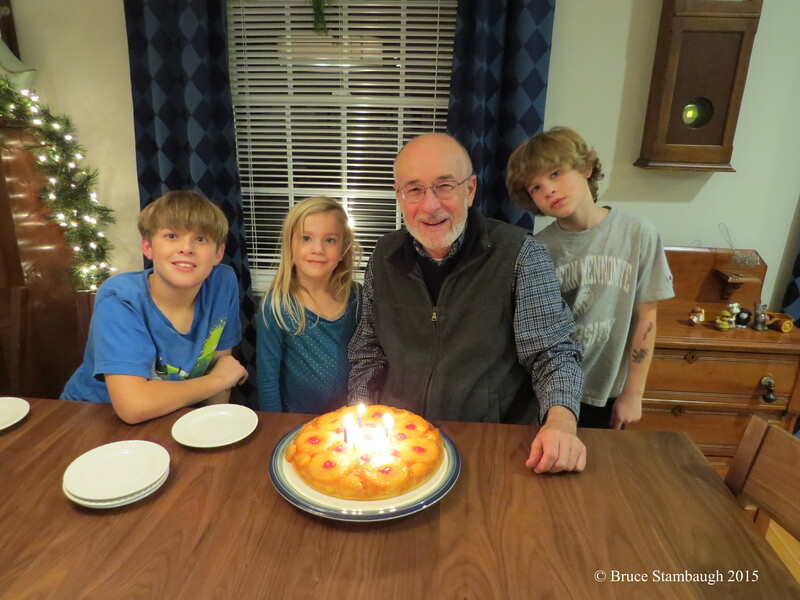 A previous birthday with the grandkids. When I was a youngster, I never liked having a birthday in December. 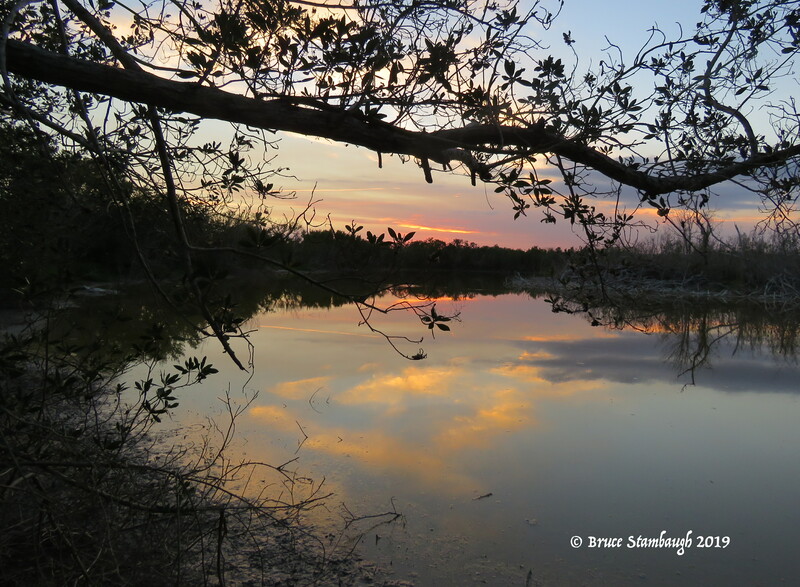 From my perspective, my day always seemed to get caught up in the hubbub of the holidays. I suspect that was just my juvenile selfishness surfacing. Fortunately, I eventually got over that attitude. Unlike others I know I thoroughly enjoy birthdays. If they get hidden in the holiday hoopla, so be it. I’m still determined to embrace each and every one. That wasn’t always my attitude even far beyond youthful facetiousness. I remember when I turned 30. It wasn’t pretty. I got depressed. I couldn’t believe I was that old. I look back at that experience and chuckle. I’ve learned a lot since then. I’d trade that day for this one in a heartbeat if I could. The tree went up right in time for my birthday. After that, birthdays became more or less routine celebrations unless someone pulled a surprise on me like some teachers did once. They thought it would be cute to post a larger than life sign in the front yard of the school announcing the principal’s 39th birthday. I played along and tried to be as good-natured about Jack Benny’s perpetual birthdate as I could. Based on the comments of others older than me, it was turning 50 that I really dreaded. As it turned out, the watershed date proved a dud. I had already lost most of my hair by then anyhow. It was turning 60 that really got me. It was as if a switch had been flipped and my body suddenly screamed at me to slow down, take a rest. My knees ached. What muscles I still had disappeared just like my hair had long before that. It was my body’s way of saying I really wasn’t 39. There was one ironic quality about hitting the big 6 0. It bothered my son more than me. He had turned 30 seven months earlier. Nathan rightly recognized that he was exactly half my age and that would never happen again. That thought alone agonized him and energized me. Now that I’m about to turn 70, I recognize and accept that I’m heading down the homestretch. I look back on my life with smiles aplenty. I’ve enjoyed this long ride and have many wonderful folks to thank for getting me to this point. My wife leads that pack. Behind her are my son and daughter, their significant others, our three grandkids, my siblings, and a host of other family, friends, and coworkers. I’d be remiss to forget my late parents and in-laws. Regardless of our achievements, none of us passes through life alone. 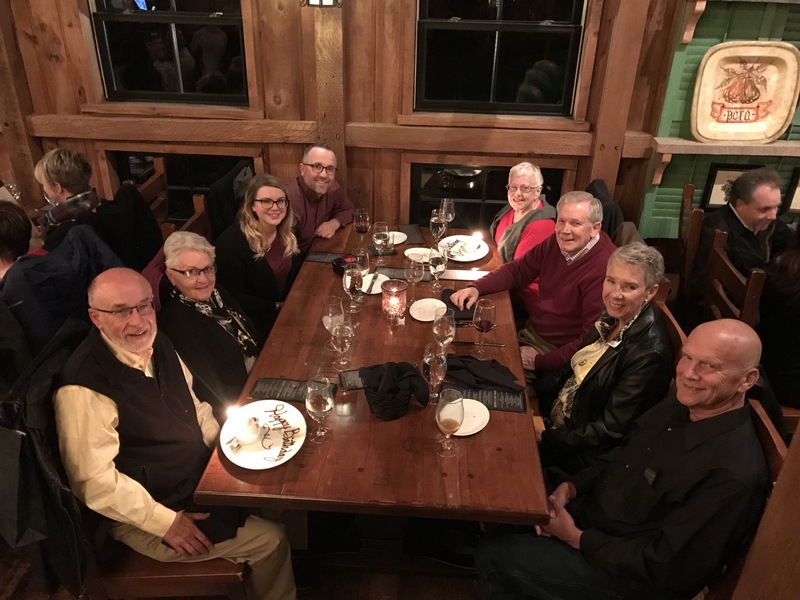 Celebrating birthdays on a recent visit to Ohio. As I look back, of course, I also recognize a few of my imperfections and mistakes. Others are better suited to identify those faults. Thank goodness that heartfelt apologies can create lasting lifetime friendships. I’ve tried to learn from my errors. Now that I’m 70, I want to keep that learning process moving so that my old brain remains sharp and curious for as long as possible. I recall much that has happened in my seven decades of walking this marvelous planet of ours. Both personal and universal, joyous and calamitous events have filled those years. Birthdays are hallmarks of individual lives no matter the age or when they occur. I’m just grateful to be 70. That said I’ll aim to redouble my daily efforts to serve as wisely and productively as I can. At my age, that’s all that can be expected. 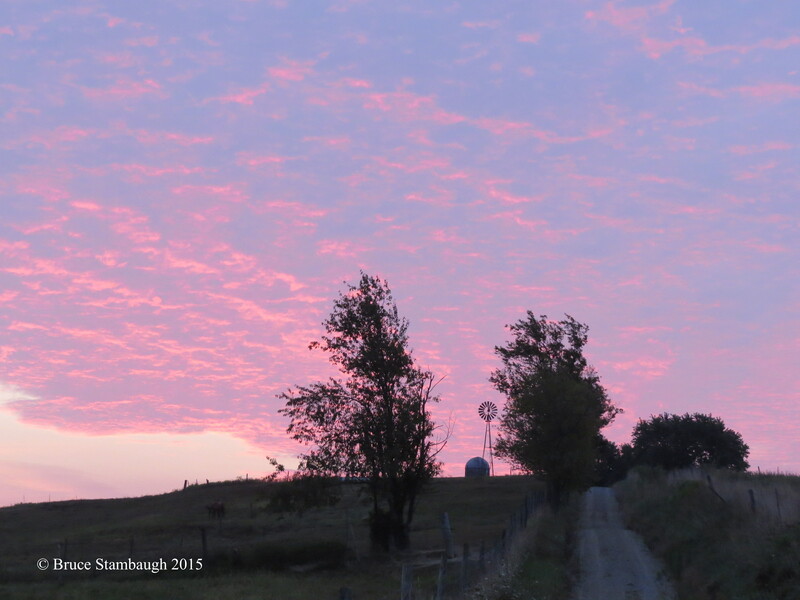 Hoping for a rosy road ahead. A few of Buck’s books. The news of my friend’s death fell heavy upon me as if all of Autumn’s trees had simultaneously shed their rainbow of colors in one smothering, leafy avalanche. 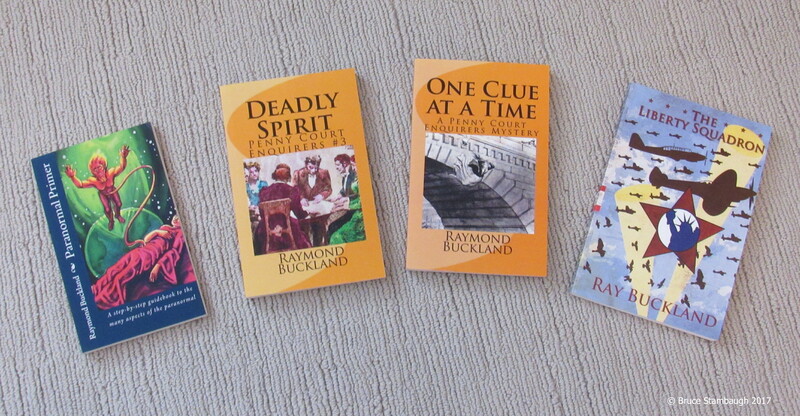 Raymond Buckland meant that much to me. I wasn’t alone. As word spread of Buck’s death, other friends who knew him began sharing words of praise on social media. All lauded his kindness, generosity, and love for life. He was truly a caring and gentle soul who touched many people around the globe. Buck’s spiritual heart was full of love and light. His human heart had finally failed him. I met Buck through our weekly writing group, the Killbuck Valley Writers Guild. 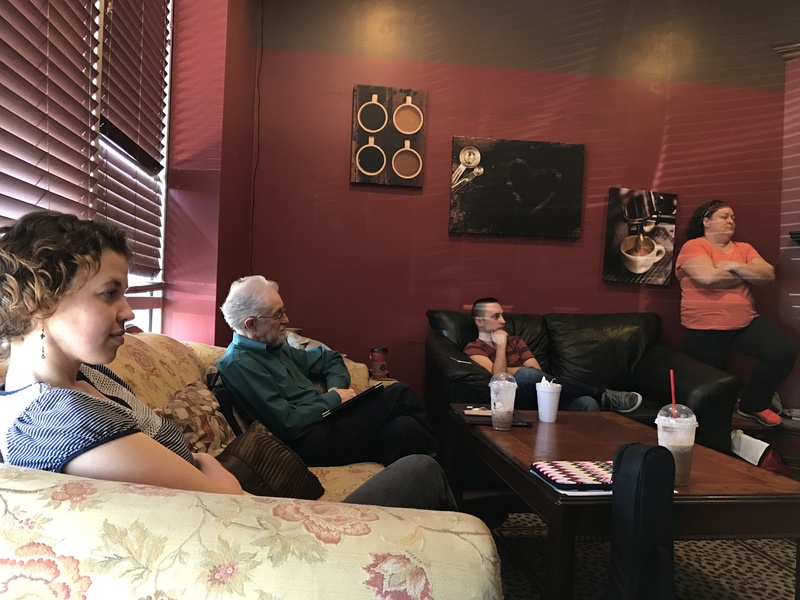 We met every Sunday afternoon for three hours at Jitters Coffee House in Millersburg, Ohio. I think Buck picked that venue as much for the yummy pastries as the central location. At the writers’ group, we called him Buck. To others, he was Raymond or Ray. Born in London, England, his alluring British accent enhanced his magic words that he loved to read aloud. Buck was facetious about details, extracting them from his broad life experiences and incorporating them into his informative, vivid, and descriptive writing. He often used the settings of his formative years as the scenes for his many books. When asked, Buck didn’t really know how many books he had written in his lifetime. It must have been at least one for each of his 83 years of dynamic living. Buck never bragged about his accomplishments or his awards. He would share the good news of course, but always in ways that encouraged and motivated his beloved writing troupe. Through living, reading, and research, Buck became an expert in a wide variety of subjects ranging from mystery writing to witchcraft. His preferred mode of transport, however, was a Corvette, not a broom. Buck never foisted his beliefs onto others. Nor did he judge others for theirs even though they may have differed. Writing came first and foremost for Buck. It’s how he made his living. It’s how he connected with the world. It’s why he formed and nurtured the writing group. My last shot of Buck. The genre of writing didn’t matter to Buck, just so long as you wrote. We had song lyrics, poems, allegories, newspaper columns, essays, narratives, short stories, science fiction, non-fiction, and novels both written and read in our little collection of scribes. We had lots of laughs in our writing group thanks to Buck’s good sense of humor. He put that jovial approach into supportive action for the good of the community. Buck helped organize and sponsor comedy night benefits as fundraisers for the Holmes County District Public Library. Buck showed his generosity in various forms. If he knew you were serious about writing, Buck would gladly spend his valuable time advising and encouraging writers, novice and experienced alike. He also freely gave away computers, books, and various writing resources. He was a realist and idealist, a visionary and a professor all rolled into one loveable and likable human being. Buck’s generosity was a byproduct of his gracious living. Buck believed in using descriptive, sensory words efficiently. As he would remind us, one word is better than two. “Show, don’t tell” was another essential writing reminder. Showing is precisely how Buck lived his storied, charitable life. Buck loved music, both playing instruments and singing. He was as engaging as he was creative. In part, that’s what attracted so many readers and writers to him. It’s also why he will be missed so very much by so very many. Buck enjoyed participating in the benefit comedy nights. In a couple of days, the moving truck will arrive. Men I’ve never met will pack our selected belongings into the straight bed of a box truck. A couple of days later, they’ll reverse the process, and we’ll begin life anew in our new home in Virginia. I have looked forward to this event. I have dreaded this event. I am excited to be close to our daughter and her family. I’m sad that we’ll be six hours away from our son and other family members along with a lengthy list of lifetime friends. That’s the dichotomy of uprooting yourself after spending all of your quality years in one geographic location. A time to dance and a time to refrain from dancing as the scripture goes. We recognized that this major decision came with both good and bad consequences. We will spend time with our grandchildren, watch them grow from adolescence into young adults, the good Lord willing. We’ll also help out our daughter and her husband with their hectic work and household agenda. The grandkids’ and their parent’s schedules aren’t mutually exclusive of course. We recognize, too, the friends, neighbors, and family we leave behind, the relationships that will forever change by not being able to commune together regularly. We will dearly miss that. We have lots of folks to thank for their faithful support for us as we worked in the local public schools and the various community service endeavors in which we participated. We know we gained far more than we were able to give. Church, school, fire department and rescue squad, township, thrift store, friendships, neighborhood and family activities and gatherings all pieced together the crazy quilt that formed our active lives. We can never repay them all for the kindness, patience, acceptance, and including us in their lives. We anticipate this transplanting will take some time for our roots to take hold in our new community endeavors. Virginia friends and new acquaintances have already begun to make us feel welcomed, and we haven’t even moved yet. That’s southern hospitality for you. I’ll continue to write and share what I encounter as we settle in, explore our new surroundings, meet new folks, and experience all that is in store for us. My words just may develop a southern accent. Friends and family have given us an extended send-off. These last few days have been bittersweet. We have been showered with hugs and kisses, tears and celebratory well-wishes. The fellowship we have experienced added spice to the already delicious meals we’ve shared with dear friends and relatives. Close neighbors even held a carry-in and gave us an unexpected monetary gift as goodbye presents. Even the vegetation around our house blossomed a flowery finale for us. 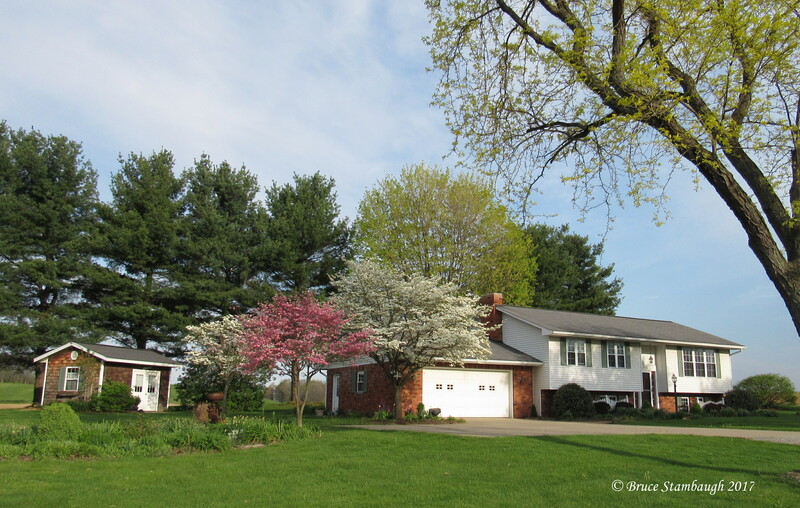 The flowering trees, shrubs, and plants bloomed the best and brightest that they have in our 38 years of living here. 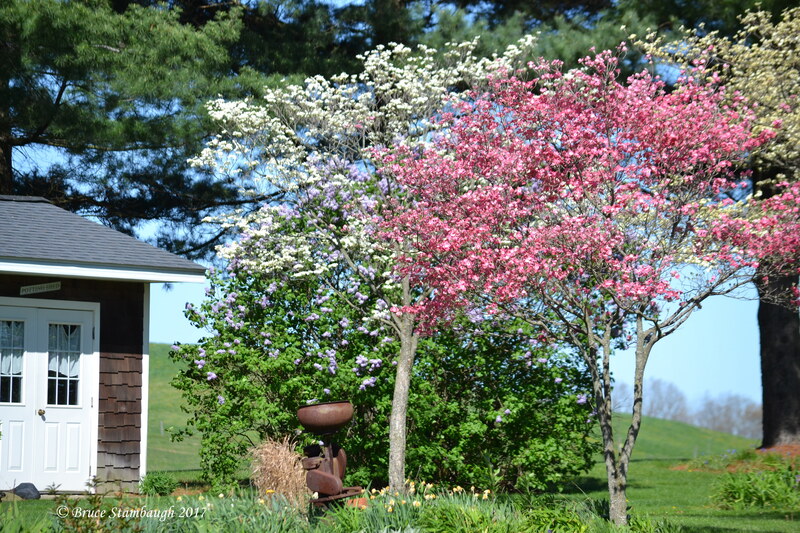 As the daffodils faded, the dogwoods and lilacs burst with vibrancy. Their fragrances were intoxicating. It was as if they had conspired to ensure us a very colorful goodbye. The backyard birds joined the party, too. The Red-headed Woodpecker, White-crowned and White-throated Sparrows, the Pileated Woodpeckers, and even the resident Bald Eagles took turns bidding us an avian adieu. Thanks to each one of you for all of your help along the way, and for your blessings as we begin this next phase of our lives. I’ll say goodbye, but not farewell. That has too much of a final ring to it. The pungent smell of ammonia tickled my nose as I sat on the living room couch reading my morning devotions. My energetic wife was already hard at work cleaning the house. In our 46 years of marriage, I had seen this scenario unfold many, many times. Of course, I do my part to help, which is to say that I mostly stay out of the way at her request. I willingly comply. I empty the wastebaskets and take out the garbage. I run and unload the dishwasher. After another tasty home-cooked meal, I make it my responsibility to clean up the kitchen. It’s the least I can do after Neva has done more than her share in planning, preparing, and serving the food. Obviously, cleaning smells aren’t the only fragrances that have wafted through our house. Neva’s gift of hospitality is multifaceted. I’m blessed by the aromas of other Neva orchestrated domestic activities like pumpkin pie baking in the oven, butternut squash soup simmering on the stove, and the spicy smell of savory tomato sauces boiling down like mini volcanoes. 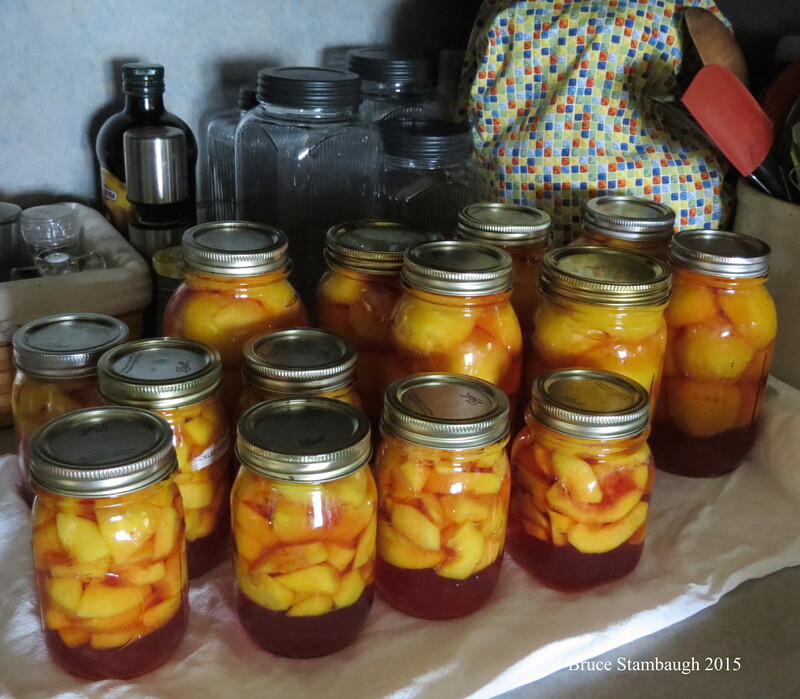 We both smile with contentment when we hear the satisfying pops of lids sealing on the freshly canned peaches. I could paint a long laundry list of sensory-stimulated pictures Neva creates in our household. To put it simply, Neva gets things done. Speaking of laundry, Neva keeps on top of that, too. I help, of course, from time to time. After all of these years, I’ve learned to dance without the caller singing out her instructions. My efforts still have to pass muster, however. But I’m no fool. When it comes to household chores, I know not to interfere with Neva’s main domain. Her gift of hospitality hasn’t been confined to our home either. Neva still finds time to help others. From birthday cards to sympathy cards to comfort food casseroles, Neva puts her faith into practice for others. She has served the church in multiple positions, locally and statewide. Our lives wouldn’t quite be the same without her devotion to volunteering at Save and Serve Thrift Shop in Millersburg, Ohio. The friendships she has made and nurtured over the years at the thrift store have enriched us individually and as a couple. Her commitment to community doesn’t stop there. She has also served with Habitat for Humanity, the annual Christmas Church Walk in Millersburg, and with volunteer fire department auxiliaries to name a few. Then there are our adult children and the grandchildren. Even 350 miles away, Neva watches over them as she can, too. With our son’s blessings, they are a big part of the reason we are moving to Virginia. We want to be closer to them to help whenever and wherever we can. 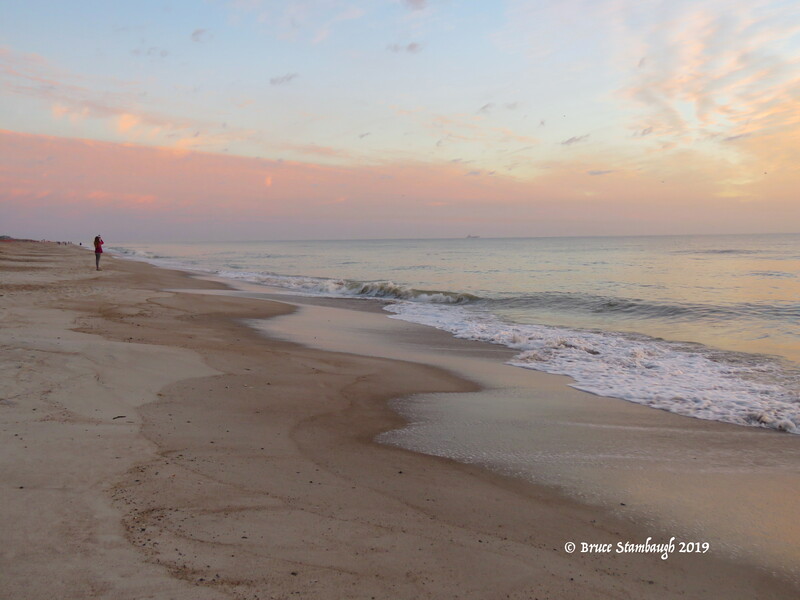 As retirees and grandparents, it’s our primary task now as we enter the winter of our lives. Career educator by profession, Neva always has taken her role as mother, wife, and domestic engineer as her chief duties. She has done so impeccably. Why am I pontificating about my wife? It’s easy for me to take her and all that she does for granted, for me, the family, friends, neighbors, and strangers. 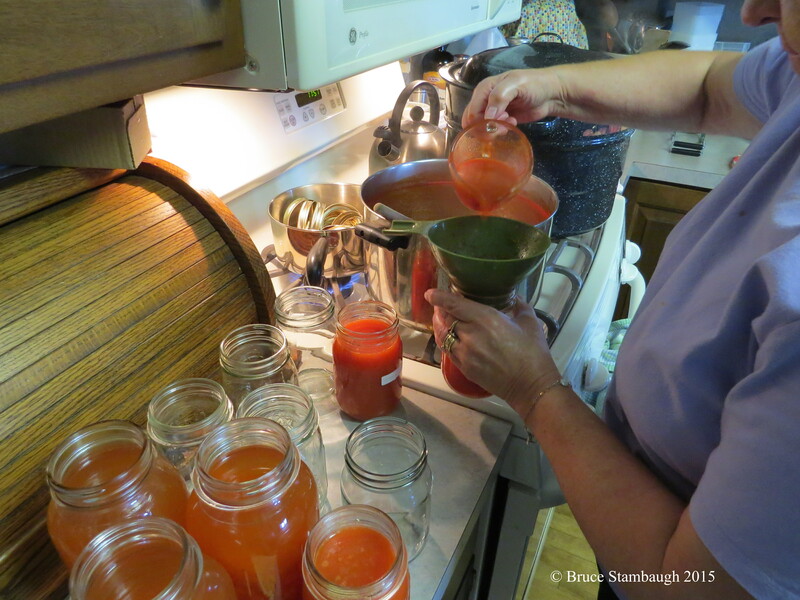 Neva has enough Mennonite stock in her DNA to deny my praise of her. But she shouldn’t. Our wedding anniversary is upon us. I want to publicly acknowledge how much I appreciate Neva and all that she does for me and for all those she has touched in our lifetime together. 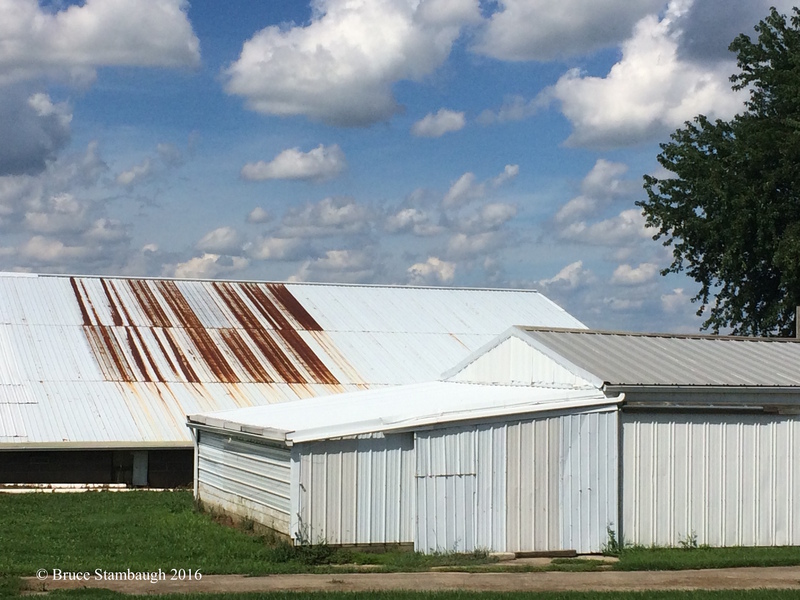 A hundred times I have driven by this rusty-roof outbuilding. What caught my attention this time around? Was it the fluffy white cumulous clouds that floated above on another warm summer’s day? Was it the way the afternoon light played on the buildings? 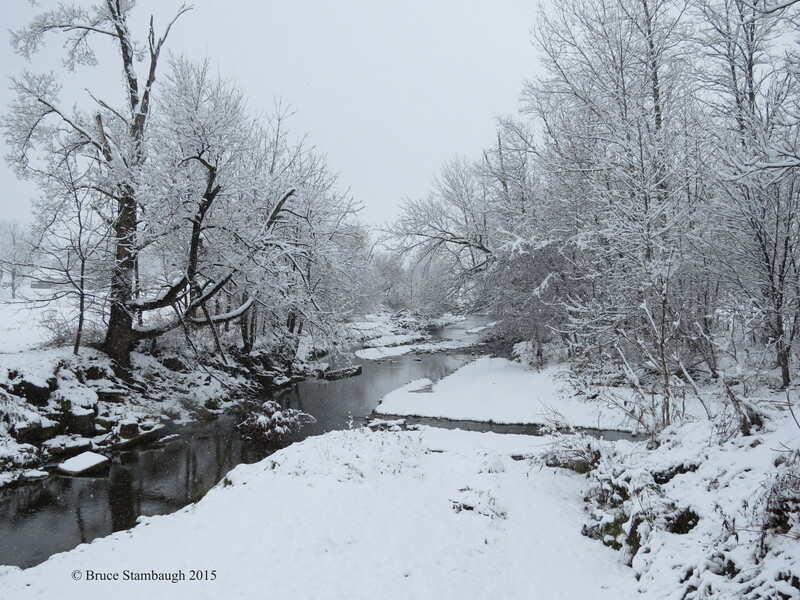 Was it merely the contrasting touch of green of the silver maple leaves in the background? Perhaps all. Perhaps none of those. In truth, I think it came down to the fact that I finally took the time to notice the beauty in the familiar scene. I loved the patterns that play out in the photo. The striations of the siding and roofs. The straight lines of the buildings overshadowed by the beautiful randomness of the clouds sailing through the azure sky. And, yes, the verdant green of the tree indeed added just the right touch like a paperclip holding together two separate photos. 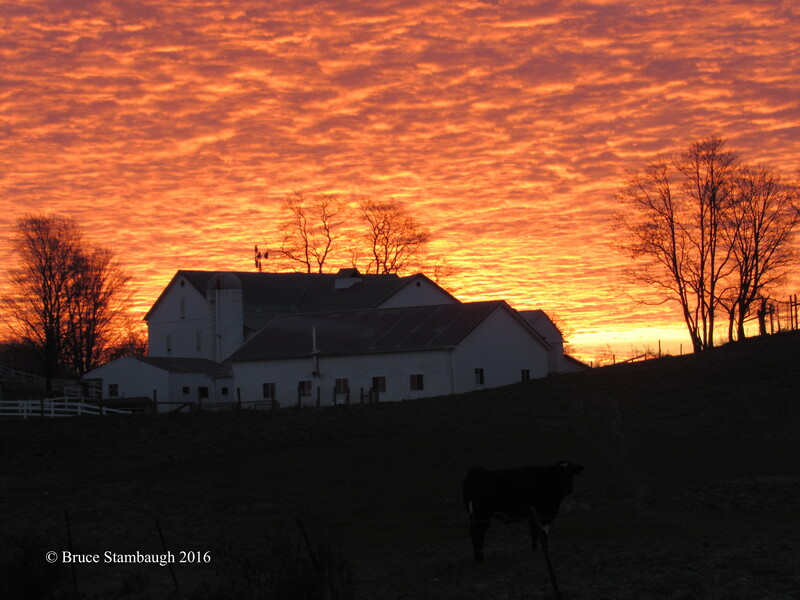 “Patterns” is my Photo of the Week.